Women on a Mission: Mom Edition: DESIGNER KIDS CLOTHES ON A DIME! I am lucky! My little man has an adorable cousin R who happens to be just over one year older than Mur-Man. Coincidentally his mom has impeccable taste and provides Steve and I with stockpiles of clothes. You should see his drawers—they are stuffed to the max with name-brand quality clothing that I have spent NOTHING on! We know we are blessed! But as a Momma I am addicted to kids clothes, kids shoes, and I require that my Mur-Man looks handsome and well-dressed each and every day (Days with Steve are always interesting…I never know what my Mur-Man will be wearing, but he is learning). 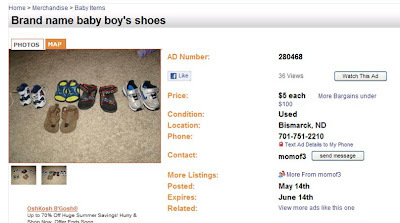 As a mom, I have discovered FAB-U-LOUS ways to buy clothes and especially shoes, and I wanted to share my knowledge with you! First up, of course there are garage sales and thrift stores. I find that these are the cheapest options, but not always the best quality. I find at thrift stores, you have to dig and find that diamond in the rough. 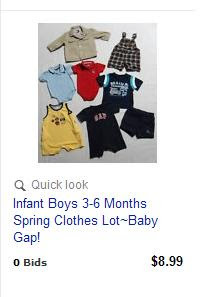 There are also consignment stores, for example Once upon a Child is a thrifty option, but prices are higher than the garage sale quarter pile. But, I have discovered that the best way to shop is online! I LOVE EBAY FOR CLOTHES AND SHOES! 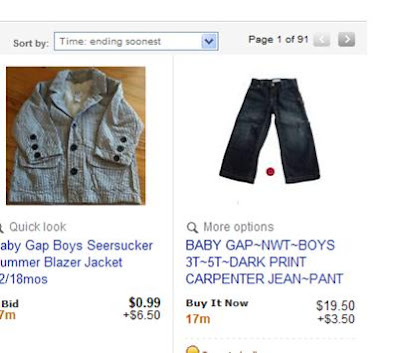 Notice how I searched "ending soonest"
Use various search terms when in EBay. You can search by brand, search by size, search by gender, or search by all three. But my favorite is when I score a “lot” of clothes or a large quantity of quality clothes for a low price! Check it out! Also, when searching sort your items by ending soonest, that way you won’t be waiting for days for an auction to end. Look at the deal I just found! Also on EBay I have scored GREAT deals on baby shoes! They are the CUTEST! I love Robeez (found on EBay for under $5.00, but at the store for more than $30.00). I love Stride Rite, See Kai Run, Pediped, and so much more! Another great option is Craigslist. 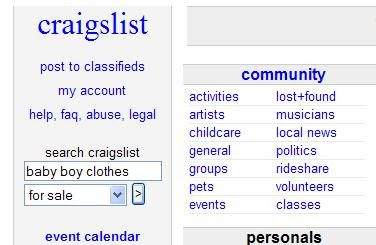 Yes, you can find clothes, shoes, and so much more on Craigslist. And if you live in little city, ND like me, check out www.bismanonline.com! 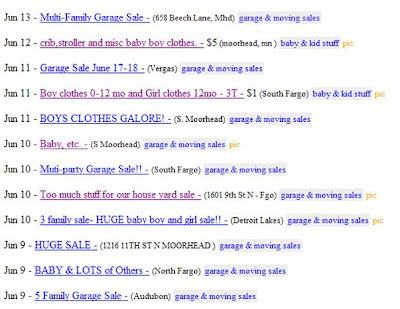 This website is out of Bismarck, but features classifieds from all over the state! (Thank you Crafty Katie for telling me about this site!) Katie scored fabulous items for her adorable baby A and in like-new condition! Baby A is ALWAYS DRESSED A-DORABLE! Adorable shoes found on Bisman! So WOMS—don’t feel like you have to hit Gymboree or Baby GAP, you can score major used finds for a lot less! DO IT! Don't forget Thrift Stores, too! I have scored some awesome deals at GoodWill and Salvation Army! Ethne and I are HUGE thrift store shopper! Love them too! Always great deals...who can pass up items for a quarter! 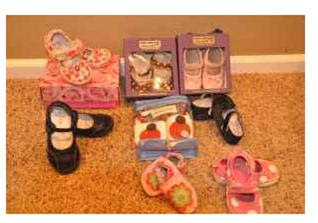 Great ideas... Look for Kids Baby Shoes made from breathable materials, such such as canvas or leather. In addition to being more durable, they will help to keep the child's foot cooler and dryer, helping to prevent blisters, discomfort, and smelly shoes. Over here we can get a best designer clothes with cheapest price, you gave wonderful suggestion on how to buying best clothes.